LENÍN MORENO GARCÉS, Vice-President of Ecuador, said, in its effort to strengthen multilateralism, his country had consistently encouraged regional integration as a logical response to an ancestral right, which never defended or closed borders between sister countries. That desire gave birth to the Union of South American Nations, in order to foster unity, eliminate inequity and promote democracy. Ecuador had fostered South-South development as a mechanism for development; one of its most important efforts had been development and reconstruction assistance in Haiti. Ecuador placed special importance on the issue of climate change, he continued. It was among 19 countries with the greatest mega-diversity in the world. The Amazon’s Yasuni National Park — considered the most biologically diverse forest on the planet — was declared a World Biosphere Reserve by the United Nations Educational, Scientific and Cultural Organization in 1989. In addition to a great density of species of amphibians, mammals and plants, it was home to two groups of indigenous people — the Tagaeri and the Taromenanes, who had entered voluntary isolation from Western culture. The park also sat on top of Ecuador’s largest undeveloped oil reserves, which contained an estimated 840 million barrels of heavy crude oil. Three years ago, Ecuador’s Government launched the Yasuni Initiative, which pledged to leave it all underground if $660 million was donated to the trust fund — the equivalent of half the current value of the oil. Preventing drilling would avoid emitting 407 million metric tons of carbon dioxide — a leading cause of climate change — which would enter the atmosphere if the oil was used. The Yasuni initiative was the most important initiative for the country and the planet and would contribute to mitigating climate change. 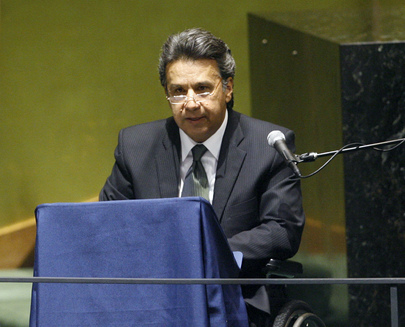 Ecuador had met many of its Millennium Goals and continued its efforts towards success, he said. However, he firmly stated that the Goals neglected a major segment of the population, namely, the disabled, a group that he described as “the forgotten of the forgotten”. Also, despite Cuba’s important contributions to Latin America, its people suffered from an illegal and illegitimate blockade, and, therefore, he called on all countries to assist its people. In closing, he said the world should be one family, and he condemned all forms of colonization. The world should preach by example, and he called for the international community to make a definitive decision on disarmament of nuclear arms and production and sale of weapons of mass destruction. Nature, he said, was the best teacher of peace.